A fire that began late Sunday night continued to smolder through Wednesday afternoon in the crowded Attaba area of downtown Cairo. Three people were killed, according to reports, but locals insisted that was the death toll on the first day only. Nine were killed in all, they said. This comes amid a series of fires across the country in the past week that officials say were almost all accidental. The downtown fire was described as an electrical fire by some officials, while others said it was a kitchen fire. 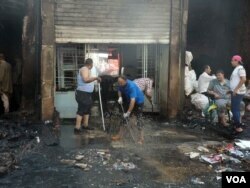 “Nobody knows who started this fire,” said 48-year-0ld Sayed Ahmed, a shop worker. 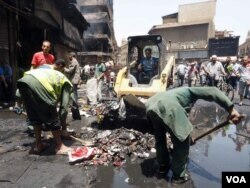 Regardless of the cause, businesses in the area were devastated, according to Haj Mohamed Shalby, a shopkeeper. Normally, the area is packed with street vendors and shoppers in busy markets. 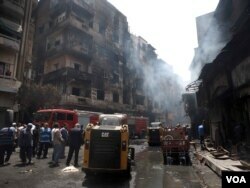 Now the streets are covered in charred remains of furniture and goods. Hundreds of businesses and apartments have been destroyed and local media estimates the downtown fire alone destroyed $45 million worth of property. Foul play is only suspected in a single blaze that broke out Thursday in a government building, according to state-owned media, and two people have been arrested. However, fear and suspicion surround the rash of fires. Some conspiracy theories blame the spate of fires on Islamic State or Muslim Brotherhood efforts to destabilize the government. Others blame authorities who have in the past called for street vendors to be replaced by regulated businesses in downtown Cairo. The fires also may be getting more attention in the local press than they normally would, according to some local journalists. Tensions between the media and the government right now have left many news sources focusing on non-controversial disasters, like fires. More pressing than who did it, locals said, is what happens next. 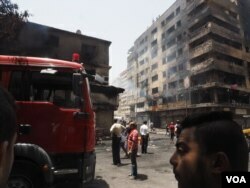 The government says it will compensate business owners and the families of the dead and wounded. But for many who live and work in the neighborhood help is not coming fast enough. Hamada Elrasam contributed this report.